The White Bear River is where many fisherman spend their days fly fishing while visiting or residing in Southern Labrador, Canada. Ankle deep in the White Bear River in Southern Labrador, Canada, a fisherman enjoys his day casting his fly fishing line waiting for a big catch. This section of the river flows fairly slow which is ideal for fisherman as the Southern Labrador sun shines down upon him. Fisherman fly fishing at White Bear River Falls, Rifflin'Hitch Lodge, Southern Labrador, Labrador, Newfoundland Labrador, Canada. Model Released. 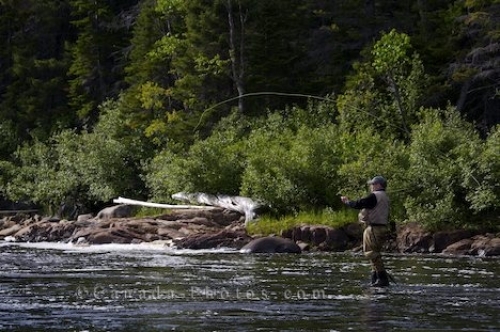 Picture of a fisherman standing in the White Bear River in Southern Labrador as he casts his fly fishing line.